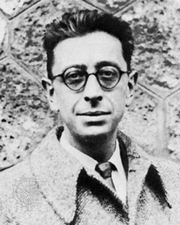 Robert Desnos was born in Paris, the son of a café owner. He became a literary columnist for the newspaper Paris-Soir and published some of his first poems in the Dadaist magazine Littérature in 1919. In 1922, he published his first book, Rrose Selavy, a collection of Surrealistic aphorisms. He met the Paris Dada group and befriended the poet André Breton; together with writers Louis Aragon and Paul Eluard, these four formed the literary vanguard of Surrealism. Desnos was hailed as the most accomplished practitioner of "automatic writing," which involved falling into a hypnotic trance and then reciting, writing, and drawing. Between 1920 and 1930, he published more than eight books of poetry, including Language cuit (1923), Deuil pour deuil (1924), Journal d’une apparition (1927), and The Night of Loveless Nights (1930). In the 1930s, he married Lucie "Youki" Badoud Foujita and wrote scripts for French radio and television as well as writing poems. His published works from this time include Corps et biens (1930), and Le sans cou (1934). At the start of World War II in 1939, he again served in the French Army. After France surrendered, he returned to Paris under the German Occupation and worked for the Resistance. Using pseudonyms such as Lucien Gallois and Pierre Andier, he published a series of essays that subtly mocked the Nazis. In 1944, he was arrested and sent first to Auschwitz and then to Theresienstadt in Czechoslovakia. There he contracted typhoid and died in 1945. His collection Selected Poems was first translated and published in English in 1972 and again in 1991. Geboren in 1900, sloot hij zich aan bij de groep Dadaïsten, en werkte voor het tijdschrift "La Révolution Surréaliste". Na de breuk met de surrealisten, ging hij werken als journalist. Tijdens de oorlog ging hij in het verzet, werd gearresteerd en weggevoerd. Hij verbleef in verschillende concentratiekampen, en overleed op 8 juni 1945 te Mariënstadt. Robert Desnos is currently considered a "single author." If one or more works are by a distinct, homonymous authors, go ahead and split the author. Robert Desnos is composed of 3 names. You can examine and separate out names.